Welcome to the world of craft beer in Bali! When picturing images of Bali, you may expect serene beaches, idyllic retreats, surfing and clear blue waters with lush green surroundings – it’s true, it has all of these, but perhaps you would be surprised to hear of the growing craft beer in Bali movement enjoyed by travellers from around the world. I’m going to give you the top tips and some of our favourite locations for where you can try craft beer in Bali. The various microbreweries that have popped on the island offer exciting new craft beers, in addition to being comparatively new to the island they offer two significant advantages over their imported counterparts – they are cheaper and for many a beer drinker, they taste better with advantages such as spring water tapped from a mountain bore hundreds of meters below the surface. What’s more, they rely on the abundance of locally grown ingredients and flavors to complement the hops, barley, and water. I’m of course talking about Stark Craft beer in Bali, which is currently the only craft beer manufacturer upon the island. Since its creation, the brewery has ventured into different variants to suit every palate including Wheat, Dark Wheat, Indonesian Pale Ale (IPA), Low Carbohydrate Lager, Lychee Ale and Mango Ale. Enough variance to suit the preferred nuances of any a drinker. The company believes that its beer is so special due to the water, sourced from Batu Karu Mountain. The brewery is located in Singaraja a rural port town in northern Bali offering access to the purest spring water directly from the mountain. One other beer manufacturer on the Island, Bali Hai use more traditional manufacturing processes and make light amber beers, the difference, however, is they lack the same balanced water source. Does this matter? Most likely not, but it’s certainly a unique selling point for Stark Craft Beers which helps it differentiate itself from other more mass produced breweries such as Bintang and Anker who have to work with less consistent water sources. Now, with all of this said, even though Bali has only one locally produced craft beer, it has many fine locations to sample Stark, other Indonesian beers as well as those imported from Germany, Ireland and the British Isles. I’m going to offer up a selection of some of these establishments and venues now giving you insight on where to try craft beer in Bali. So sit back, listen to the music and drink stark. If your travels find you in search for a natural bar then the Green House Kitchen and Beer Garden may scratch that certain itch. Undoubtedly, the most striking features of the Green House Kitchen is how easy it is to get lost in the moment of watching traditional Balinese paddy farmers working their fields while enjoying a cold refresher craft beer. This may not be the only bar in Bali to be surrounded by views of Paddy Fields but it sure is spectacular. Green House Kitchen & Beer Garden is an innovative hangout spot in Kadampang, Kerobokan area mixing the traditional with the new. Even though the main focus of the bar is its amazing view of the rice field, the menu offers a plethora of traditional Balinese food to nurture your mind and stomach. 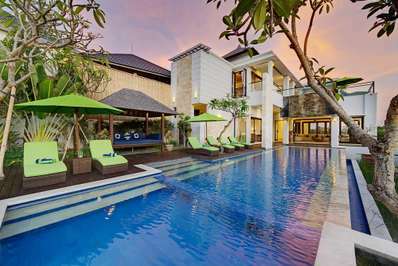 BGS Bali offers a unique setup and has something for everyone. The blended premise not only offers beer and coffee but also a high-end surf shop close to world-class beaches like Uluwatu, Bingin and Padang Padang. Uluwatu beaches are probably one of the most famous on Bali’s Bukit peninsula, renowned for the cliff top temple that sits proud on the delicate limestone cliffs. BGS Bali offers a cool contemporary environment but with a big friendly smile welcoming everyone no matter what your into (coffee, beer or surf). So regardless of what you are looking for to complement the craft beer in Bali, I’d recommend you pick at least two of my following favourites; sit back, relax, listen to the waves crashing on the shore, drink some beer, coffee or cocktails, make a new surf purchase, or simply soak up the sun in an area surrounded by adventure — and refresh yourself with a beer while enjoying the walks which offer 360° eagle-eyed views over the sea and land. For a family friendly location to sample craft beers then HQ beach club is for you. HQ beach club is an exciting venue, offering something for the whole family. The club features a great pool, beach front access and food and drinks suitable for a variety of budgets (perfect if you have little ones who if they are anything like my own children are always hungry). 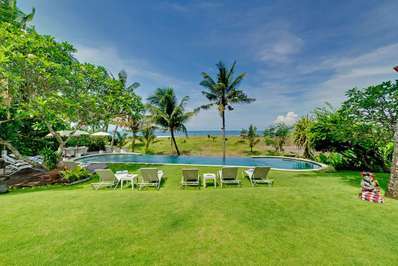 The club is situated on the beach front of the Kuta Coastline right next to the Balawista Lifeguard Headquarters so there is peace of mind for the whole family. HQ offers two different restaurants so finding something to suit everyone’s taste and stomach should be possible for even the most disagreeable families. However, the most unique feature of HQ Beach Club is the ‘Minus 2 Beers’. This is not your run of the mill cold beer. This beer is chilled to minus two degrees, which we have been informed gives it a unique taste with added refreshment. Indonesian favorites such as Bintang and Bali Hai are on tap as well other imports such as Guinness, Heineken, and Carlsberg. Culture, courses, and beer all in one place. Then Teras Gandum Beer Garden and kitchen is the spot. Located within Rumah Sanur Creative hub is a well-kept beer secret. The quaint beer garden features a first-rate selection of worldwide beers as well as the more local as well as plenty of space to relax, reflect and nurture your creative side. There is no typical day at Rumah Sanur, and Teras Gandum plays host to musicians, designers, and artists showcasing their work and talents. So select a beer get creative and experience the unexpected. For the English travelers who might be homesick and missing the traditional Sunday Roast, then head towards Kerobokan and The Plumbers arms for all day English food and European beers to satisfy those cravings. Not only does the bar offer English cuisine, but its family-friendly also offers quiz nights as well as having pool and darts. The bar offers four different types of Bintang, selections of extra cold Heineken, Kilkenny as well as a huge selection of other imported and home-brewed beer, spirits, and wine. Great food, great drink, friendly staff, and a local atmosphere – it’s almost like being in England while still having all of the craft beer in Bali available in bottles and tap. Want to drink craft beer in Bali all day and then party all night .. Then look towards the sky, well sky garden at least. Sky Garden is located in the centre of Kuta’s nightlife district and is a popular place to party. Sky garden offers spectacular beers, cocktails and an unforgettable night being Voted as the #1 club in Indonesia. The club plays host to the world’s best DJs who flock here to play a set, drawing in a huge crowd every night. This is not your average club, the club features an all you can eat buffet so rumbling stomachs won’t make you take off your dancing shoes. As well as the buffet special offers on spirits and beers may entice you to spend more than a few hours here. What more can be said about BARracuda Bar: A paradise for nature and sea lovers and an unmissable spot for snorkeling and diving. BARracuda Bar serves up great traditional food and ice cold beer – perfect after taking a dip in the clear waters. If swimming isn’t your thing, the Sea swing offers some great photo opportunities as well as dipping your toes in the ocean without stripping off. As well as relaxing in the bar while drinking your favourite craft Bali beer, trips and activities are also on offer. Why not catch your own dinner on an organized boat trip and then the bar will cook and serve it you for dinner. If all of this still hasn’t floated your boat, then why not take a boat on a day trip around Karangasem Regency: Tirta Gannga (the water palace), Ujung Palace, Brinne Rice Fields, and white sand beaches. What more could we want in a bar? Instead of searching all over Bali for the good craft beer, why not visit Beer & Co? They stock one of the widest selections of Balinese beer as well as other imported favourites and less well-known beers. The amazingly friendly staff have a great knowledge if you are new to craft beer or are just looking to try something different. The bar in Legian Street 133, not only offers beer but wines and spirits to suit your palate. Delivery Service also available around Kuta and Seminyak Area, so if you were looking for a night in instead of out on the town, you can have a beer or wine delivered straight to your door.